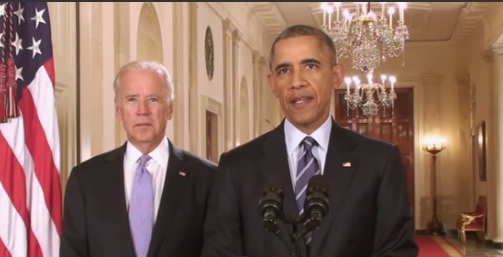 US President Barack Obama, with Vice President Joe Biden, delivers remarks in the East Room of the White House in Washington after negotiations culminated into the Iran nuclear deal. Washington DC: After many months of principled diplomacy, the P5+1 — the United States, the United Kingdom, France, China, Russia and Germany — along with the European Union, have achieved a long-term comprehensive nuclear deal with Iran that will verifiably prevent Iran from acquiring a nuclear weapon and ensure that Iran’s nuclear program will be exclusively peaceful going forward. Making this announcement in a speech from White House, US President Barack Obama said that this deal stands on the foundation of the Joint Plan of Action (JPOA), achieved in November of 2013, and the framework for this Joint Comprehensive Plan of Action (JCPOA), announced in Lausanne on April 2, 2015 that set the requirements for the deal with the P5+ 1 and Iran, alongside the European Union announced today. With this deal in place, the U.S., and its allies, and the international community can know that tough, new requirements will keep Iran from obtaining a nuclear weapon, Obama pointed out. Building a nuclear bomb requires either uranium or plutonium. 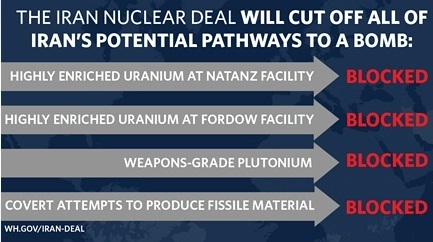 But with this deal, Iran’s four possible ways to leverage those fissile materials are blocked.